Pre-apology: I have taken more than two months to complete this post. Please pretend that you’re reading this in late September so you don’t think about how slack I am with consistent blogging. Before starting this project, I spent far too much time looking at pictures of vertical gardens, trying to discover how they’ve actually been done. This was frustrating, because some are from companies who want you to pay them to build a vertical garden, and the rest are regurgitated images from sources long since lost, talking in vague generalities about how nice green walls are. So, here’s exactly how I created mine. Wall mountable hooks. I used these, which are slightly too large. You should use these if you want to learn from my mistakes. Screws to mount the hooks. Step 1: Mount the hooks. The bamboo poles are really sturdy, they’ll only need supporting at either end. The hooks I listed are strong enough to support two of the bamboo poles each, so you only need n+1 of the hooks where n is the number of bamboo poles you need to support in a row. Step 2: Rest the bamboo poles on the hooks. Tie them in place with twine if you want. I did that later. Step 3: hang the s-shaped hooks off the bamboo. Again, these are strong enough to carry the weight of a pair of wall hoggers, so I’ve gotten away with n+1 hooks for a row of n wall hoggers. Step 4: hang the wall hoggers off the hooks. Bear in mind that if you’re not instantly ready to plant in them, you will want to weight them down with some stones or something as they are prone to blowing around and falling off when they’re empty. That’s it. 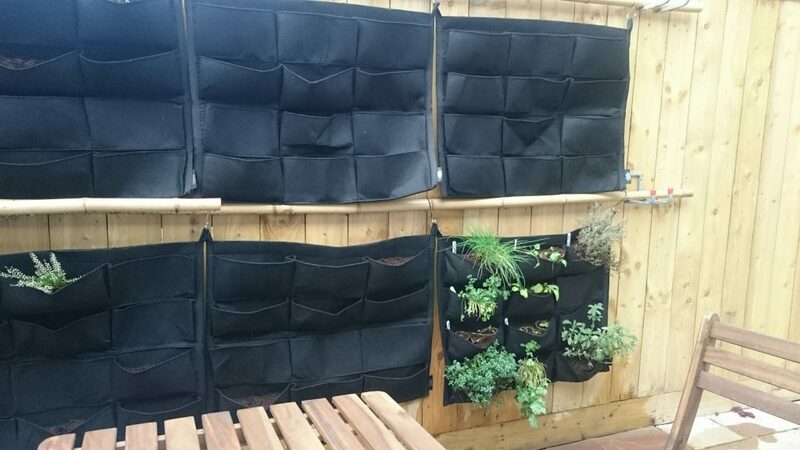 Your vertical garden space is now ready for planting. So, let’s quickly run through the pros and cons of my incredibly basic approach. PRO: This approach is really modular. You can scale it up or down depending on how much space you have. Different shaped wall hoggers are available, so you could fit this design in pretty much anywhere. CON: The s-shaped hooks are prone to sliding along the pole, meaning the wall hoggers don’t hang flat to the fence. I’m mulling over the best solution to this- outdoor-grade elastic bands, maybe? PRO: This is really easy to construct. Screw the hooks in and the rest is just hanging things in place. SORT-OF-CON: This probably isn’t the absolute cheapest way of achieving this result. My total cost was about £235 before I even put any plants in. I have seen pictures of approaches that looked cheaper (e.g. using plastic guttering pipe for planters) but there did always seem to be a tradeoff of cost against ease of assembly. A lot of that cost was bamboo, which is incredibly cheap per metre but incurs a high shipping charge as it’s so awkward to move. NOTE: Normal fences don’t like water. Do not use this design as-is if you have a normal fence. 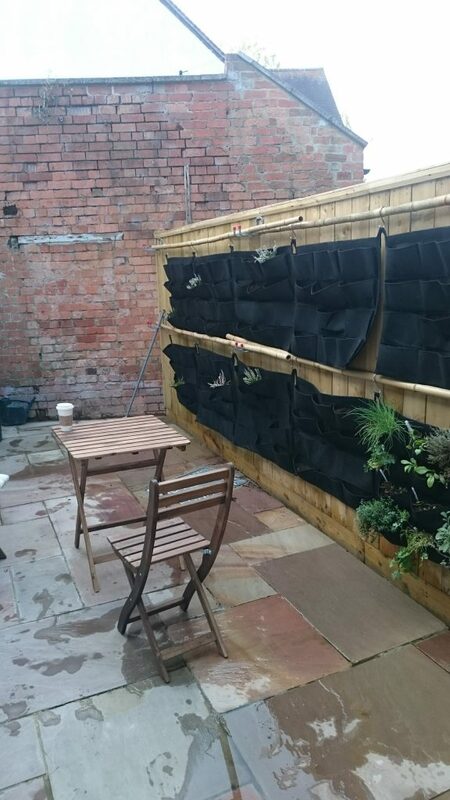 When Tim from Pro Build specced out my fence, he used specially treated timber which will not absorb water. If your fence is not made from this timber, you need to put some kind of water protection between the wall hoggers and the fence, otherwise your fence will get damp and rot incredibly quickly. 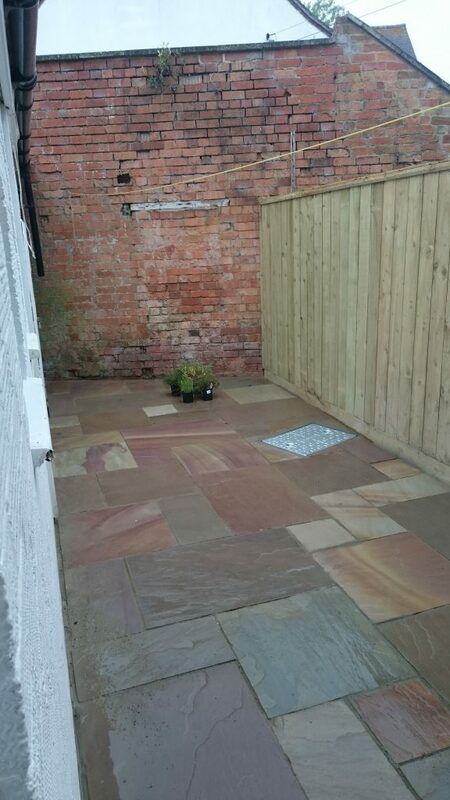 When I first started planning to turn our courtyard into something less horrible, I was young and idealistic and wanted to do everything myself. Then I spent hours watching tradesmen assembling fences and pavements on Youtube and realised that there isn’t room in our garden for me to learn by making mistakes. There’s nowhere to hide any errors, so everything has to be done well, first time. So I got a man in. Finding tradesmen is a notoriously awful exercise, but Rated People has made that somewhat less painful, and it turned up Tim from Pro Build, who has been outstanding. The whole job was done within three weeks of him quoting on it. The only other guy who got around to quoting was saying he’d not be able to start until October! Now that what I’d think of as the shell has been nicely finished, we can start putting actual garden stuff in. I’ve got a bunch of hardware arriving which I will run through as I start putting things together in the next blog post! 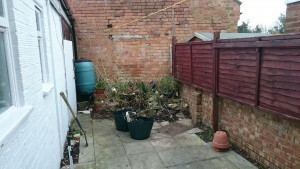 I haven’t blogged about the Geek’s Garden project for nearly four months now. You might think this means I’ve been slacking. And you’d be mostly right! In my defence, there were extenuating circumstances, and there is now some progress. Not long after I last blogged. Monty Don tweeted out a call for gardens and their gardeners to feature in the 2016 series of Big Dreams Small Spaces. Getting advice from Britain’s Favourite Gardener™ is not something to be sniffed at, so I applied. And they responded! I was quizzed heavily over the course of a few phone calls, and photos of the courtyard were exchanged. Then they asked me to postpone any work I was planning, on the basis that if they were going to film us, they’d want to show the transformation, which would be very undramatic if the work was halfway done. That process started in mid April. In mid May, one of the Big Dreams Small Spaces team came out and recorded an audition tape, featuring me and Coralie standing in the garden, talking about our plans, and a few closeups of the mess that was the current state of affairs. The whole thing was quite surreal. I don’t think I’m made for telly. Apparently, neither did the BDSS team as two or three weeks later we got a call that said we weren’t going to be on the show. C’est la vie! I was mostly annoyed because I’d delayed doing any work in the garden by more than six weeks, so I was raring to get started. Then it rained all through June, which is not conducive weather for dragging soil through your house. I finally restarted the process of extracting all the soil from the back of the garden, but progress was slow until I bought started buying HippoBags. They aren’t what I’d call cheap, but they take up less space than a skip and they’re way more efficient than driving down the tip over and over again in a small car. 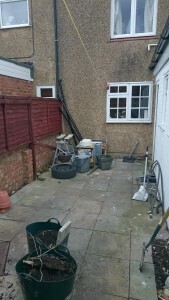 That brings us up to the current position: most of the old paving slabs are up, the oven is still there but I’ve gotten rid of the copper piping, the spare tyre and nearly all the soil. I’ve had the first handyman round to quote us on re-paving (or decking, I’m really not sure which yet) and building the new fence to support the vertical garden. A lot of work which should have taken a lot less time. Still, lessons have been learned! Aren’t they nice? Look at that happy bumbler. I’ve finally made a decision on what to do with the western wall. 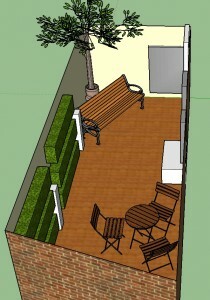 I’ll be adding a two-seat arbour, running some trellis either side, and growing a climbing plant up the whole thing. 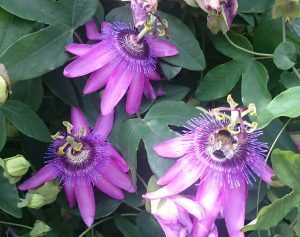 On a visit to Kelmarsh Hall I saw them growing passiflora passion flowers which are lovely, but might not be suitably hardy. Time will tell whether I can get hold of some and keep them alive. I was alerted to the existence of Monty Don’s Big Dreams Small Spaces (MDBDSS) a few weeks ago, which helped a fair bit with inspiration. Though I would like to discuss with the BBC their definition of “Small Spaces”, given that only two gardens of the twelve featured were on a similar scale to our 18m2. In both these instances, Britain’s Favourite Gardener (a title I presume Monty Don won by beating Alan Titchmarsh to a pulp in a cage before thousands of hooting Gardener’s World fans) pretty much confirmed my first thoughts: a vertical garden is the best option in such an enclosed space. The left side is North. The fence running along the northern wall is the most logical place to plant upwards, as it gets the most sunlight. Unfortunately the extant fence is, frankly, a shambles and I don’t think it can take the weight, so I’m going to have to replace it with something a lot sturdier. Great artists steal. From garden centres, if need be. I won’t take up the entire wall with herbs, because there is an upper limit to the amount of seasoning two people can consume. The yard is divided into uneven thirds by bricks that support the north wall, and the largest middle section will be where the herbs live. The western segment will be an assortment of cottagey flowers, and to the eastern side there will be some trellis with a mirror on accompanied by some climbing plants, an idea stolen shamelessly from a local garden centre. I’ve already repainted the southern wall, which is external to our extension, because it was a hideous yellowish colour turned brown with years of grime and mud. It’s now a standard issue plain white. 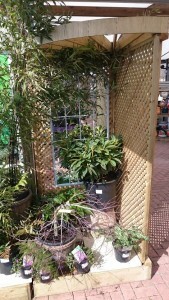 Attached will be some trellis, and a climbing rose suitable for shade will wind around the bathroom windows. That’s the idea, anyway. 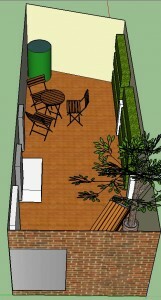 There’s not much to the eastern wall as it’s taken up by windows and drains, but a potted tree, possibly a bay tree to fit with the edible theme, will sit in the corner, behind a bench. The western wall is still a blank canvas; I have not been able to make a decision whether to use it for further climbing plants, some raised bedding, or a gurt big water feature. Ideas on the back of a postcard, please! On top of the grand designs (home improvement pun!) 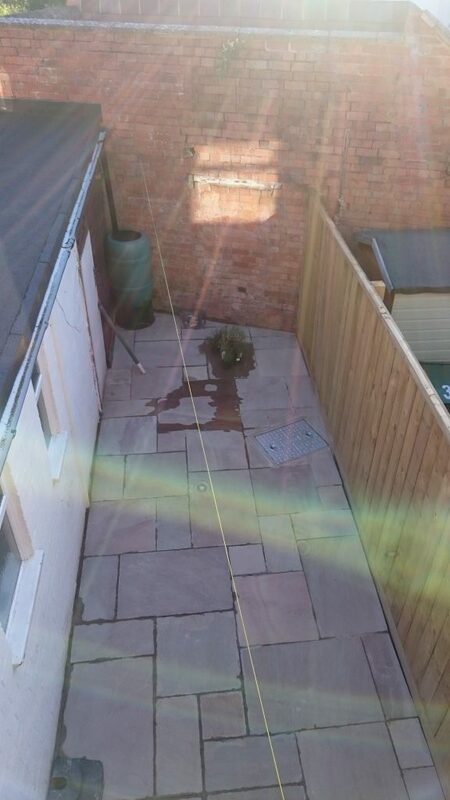 I’ve laid out above, the whole thing needs re-paving, because the current paving doesn’t cover all of the floor and is best described in style as “robbed from a council leftovers pile in the 1950s”. The 3D models dotting this article were created in Sketchup, which is free and handy for planning out a space properly instead of on the back of an envelope. Another thing that helped was the ELEPHAS laser measuring tool I picked up a few weeks ago, as it made getting the exact measurements of the yard really easy. It’s a little over two years since me and Coralie took over the smallest cottage in the village. It was a bit run down, but that’s par for the course when your budget looks like ours. Since then we’ve made a lot of improvements, and while there’s still a lot of work to do (I’m led to believe that this is the natural state of all houses ever), we’ve done enough of the “need to do” stuff that we can now work through the “nice to do” stuff. With summer approaching, top of my list is the garden. Calling it the garden may be overselling it somewhat; it’s a paved courtyard, a little over two and a half metres wide and about seven metres long. When we arrived, the defining feature was a heap of soil over a metre long covering the rear width of the yard. It may once have been a carefully maintained raised bed, but when we arrived it was home to a combination of nettles and daffodils, with a few large pot plants dumped on top. Maybe this was all deliberate and I’ve harshly judged a neatly assembled modernist piece. Indeed, we may have inadvertently enhanced that effect by adding some installation art in the form of a spare tyre, an old oven and a collection of copper and plastic pipes as we renovated the insides of the house. Seeing as there’s no obvious signs of Arts Council members issuing prize money, I have to assume not and return to my original conclusion: our courtyard is a dump. It must be razed to the ground and we must start again. The brief for the project is pretty lofty; I feel that in a small house every square foot must pull its’ weight. It must be a nice place to relax, with seating enough to entertain guests. I want a herb garden – this is an English cottage and I want our yard to play the part of a much larger English cottage garden. Also I hate paying seventy odd pence a time for fresh herbs at the local Tesco only to have them decompose within a few days. The whole garden must be incredibly low maintenance, because I am absent-minded at the best of times and I struggle to make sure I get enough water, let alone the plants in my care. 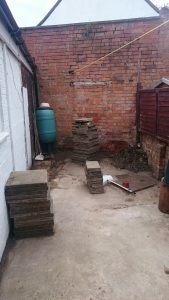 Lastly, the project must be done on a fairly meagre budget, because I much prefer to spend my money on shiny gadgets and when you get down to it, most gardens are a combination of soil, stones and plants, and it does not feel satisfying to spend lots of money on these naturally occurring and plentiful items. I’m blogging about this partly because I feel that making a target public will pressure me into meeting it, and partly because it might be useful for other amateur gardeners who can learn from my inevitable mistakes.